Exposed: Voyeurism, Surveillance and the Camera surveys voyeuristic photography from the 19th Century until the present day, juxtaposing images from both famous and amateur photographers. The theme of voyeurism is covered by undercover, paparazzi and salacious photography, but also stark images of death, execution and war. If you can’t make it to the exhibition you can still order the catalogue, available here: Amazon UK / Amazon US. Be warned that the book contains some disturbing imagery beyond what is featured in the exhibition. Here I will be taking a brief closer look at five works found in the show. The face in the paparazzi image above is actually The Face: Greta Garbo. One of the most famous and admired women in the world, Garbo became a New York recluse after retiring from films at the beginning of the 1940s. Sightings of her were rare, and this 1950s image captures the conflict between a movie star’s public persona and private life. Now older and with her face obscured, Garbo is unrecognisable, but once understood to be her it becomes a contrasting reference to all those images of her as an icon of beauty and stardom. It is also perfectly composed: notice how Garbo’s eye is perfectly in focus yet the hand is not, and how her eye fits perfectly between the end of the little finger and the brim of her hat. It is one of those miraculous images that appear to be both a product of chance and a skillful photographer. The above image would have required a pretty powerful flash to light the scene, surely a major distraction to the movie. He also took this fascinating, candid photograph of Marilyn, skirt lifted, on the location set of The Seven Year Itch. A famous series of images by Walker Evans shows portraits of unsuspecting travellers on the New York subway. To capture commuters unaware, Evans made these images covertly using a hidden camera stowed away in his coat, only really made possible by the greater portability and low-light capabilities of modern cameras. What resulted were unselfconscious images of daily New York life, and what is life in the city but a series of arduous journeys back and forth? This series is available in a quality hardback by the Museum of Modern Art, (Amazon.com / Amazon.co.uk) which will surely become a collector’s item pretty soon. The exhibition contains some of the most famous images in photography, including this Cartier-Bresson image of a bicycle captured perfectly within the limited space of the composition. It is often claimed that Cartier-Bresson took the most perfect snapshot, an image that crystalised ‘the defining moment’, in Behind the Gare St. Lazare, Paris. In the above image Cartier-Bresson found his composition in the twisting lines of the bannisters but waited for something to fill the space. When a bicycle came along he clicked at the above moment. Spontaneity in photography can be a difficult effect to achieve. Sophie Calle is a French artist who came to prominence in the 1970s with her combination of text and photography in her art-as-life narratives. She took elements of detective fiction and connected them to her real life. In one project presented by the exhibition, she asked a private detective to tail her and send her a report, in essence following herself. It’s a piece that would resonate with anyone familiar with noir movies or the nouvelle vague and is a storyline that would fit well in a postmodern noir tale. But there are also some truly chilling and disturbing images: a body falls from a hotel window in a desperate escape from a fire; a suicidal man jumps from a bridge after the crowd below collectively encourage him; the decayed remains of a victim of the Rwandan genocide has sunk into the earth. Elsewhere in the exhibition are works by famous photographers such as Paul Strand, Garry Winogrand and Dorothea Lange and as a whole provides an overview of the entire medium of photography. Again the catalogue is available here (Amazon UK / Amazon US). More information about the exhibition, which runs until 3rd October 2010, can be found at the Tate Modern website. In an occasional series I will be publishing images of stars found in contemporary cities. Here we have an image of Marlene Dietrich in Berlin. 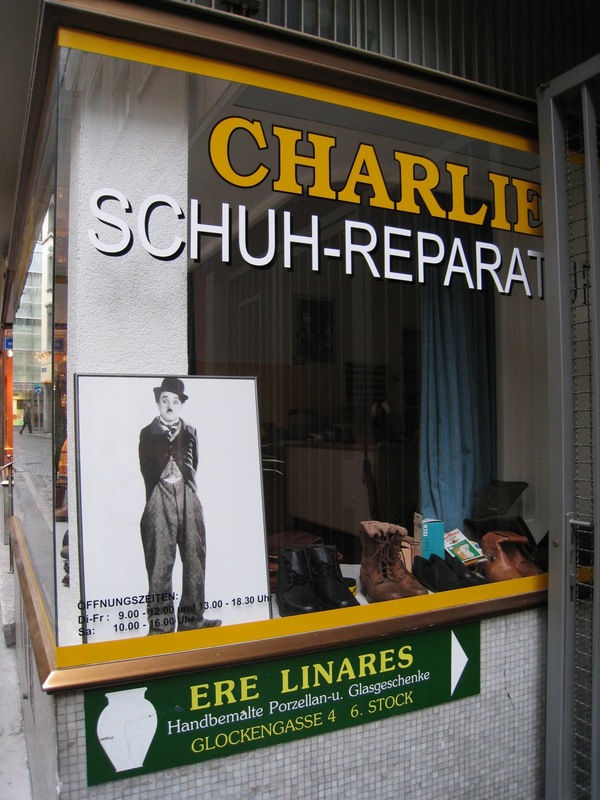 You can see Charlie Chaplin, John Wayne and James Stewart in another city here. I’d love to see any of your images of stars in the city, send them over and I’ll add them to the site: classicfilmshow@gmail.com. My post on Why 3D Doesn’t Work has proved to be both popular and contentious, so I thought I’d follow it up by making it clear that 3D is not the sole domain of multi-million dollar movies. 3D imagery is in fact a 19th Century technology. Stereoscopic photography emerged around the late 1830s, soon after the development of photography itself. But the stereograph boom really occurred in the 1850s after its success at the 1851 Great Exhibition. There is something endlessly fascinating about early stereoscopic views and they work in a far more delicate and beguiling way than the latest wave of 3D cinema. I urge you to seek out a stereoscopic viewer, whether in a museum or even seeking out your own online, or even make your own. For more details about stereography take a listen to this episode of Jeff Curto’s brilliant History of Photography podcast or visit these comprehensive links to stereoscopic photographs. This Summer I went to see a Buster Keaton film outdoors at The Scoop, a kind of amphitheater alongside the Thames by Tower Bridge. Anyone passing by could have stopped and watched The General which continued to play during the chilly night. I took these photos of the film which in some ways is quite a surreal sight: a silent playing to the city itself, and to a curious, appreciative and bewildered stream of onlookers. Movie stars are defined by a combination of what we observe of them on-screen and our perception of them outside of the cinema. This would include photographs, articles, interviews, books, posters and merchandise. Film stars and their star images often become far removed from the films themselves. Here are three examples of movie stars as part of the contemporary city. In this case, Charlie selling a shoemaker’s, Jimmy Stewart selling Stetson hats, and John Wayne’s name selling a six-shooter. All photos by Christian Hayes.